Mulberry House - Rondebosch Accommodation. Mulberry House is situated in the heart of Rondebosch with easy access to Cape Town Airport and the City centre freeway. 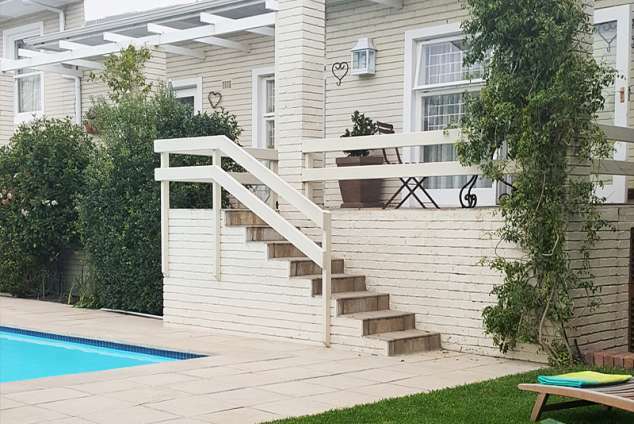 It is walking distance to Newlands rugby and cricket grounds. Claremont shopping centre, Hospitals, the University and Kirstenbosch gardens are all a 10 minute drive away. Top golf courses are all less than 15minutes drive. The home is very secure, in a quiet road and has 2 newly refurbished, upmarket units both with secure off street parking. The larger Blue room has 1 extra length king-size or 2 single beds, a separate kitchenette with fridge, microwave, 2 plate stove, kettle and toaster. The large ensuite bathroom has a shower, bath, toilet and double basins. The slightly smaller adjacent Red room has a kitchenette, kingsize bed (or 2 single beds) and an ensuite bathroom with shower, bath and toilet. This can be used in conjunction with the Blue room for families. Both rooms are supplied with cotton linen and towels, heated towel rails and stocked with tea, coffee, milk, 2 cereals and fruit on arrival. There is ample cupboard space. Rooms are serviced biweekly. There is satellite tv and wireless internet in both rooms. Smoking is only allowed on the patio outside the rooms. Guests may make use of the large swimming pool and barbeque. 13304 page views since 06 Sep, 2011. Last updated on 01 Nov, 2018.